I had hoped that Thursday 10 September could be kept clear for a HODs day, but funerals got in the way. I returned from the Crem via Gateshead and called in at St Edmund’s Chapel (NZ256632). 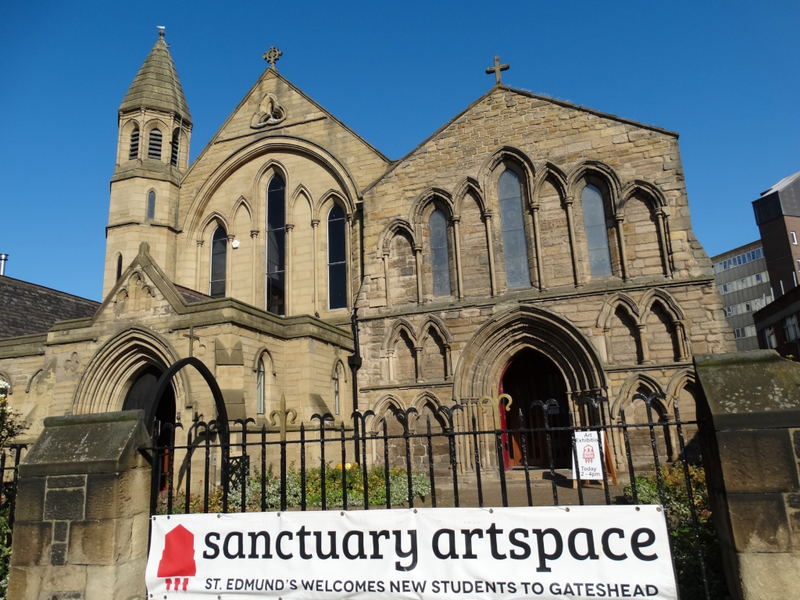 It is right in the middle of the town – a town I have never properly had a walk round – and the church is finding a new role as an Arts’ hub and base for the Chaplaincy for the hundreds of students who now live close by – there are student flats above Tescos. 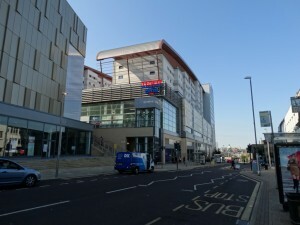 It is part of the Gateshead Team Ministry, and the church history is on their website. We wrote to them a decade or so ago when we tried to get all the St Edmund churches across the country to St Edmundsbury Cathedral for a Festival Day. I now find that this chapel is dedicated to Edmund of Abingdon, the other Edmund, the one who was Archbishop of Canterbury from 1233 to 1240 … perhaps that is why they didn’t reply! This Edmund was canonized in 1246. 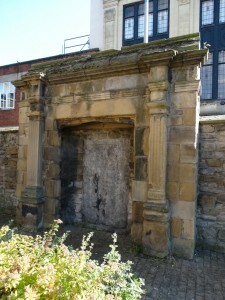 Around 1248, Nicholas de Farnham, Bishop of Durham founded a chapel and hospital, of which St Edmund’s is the surviving building – it is the oldest surviving building in Gateshead. The hospital was chiefly intended for the ‘refreshment of the soul’. A master and three priests were appointed to celebrate four masses every day. By 1325 buildings included a buttery, kitchen, brew house, granary, byre and pigsty. You can imagine that the chapel which would have been the focus of life. The hospital sat beside the Great North Road – I wonder if a previous pilgrim said his prayers in St Mary’s Morpeth, then travelled south and did likewise in St Edmund’s Gateshead. 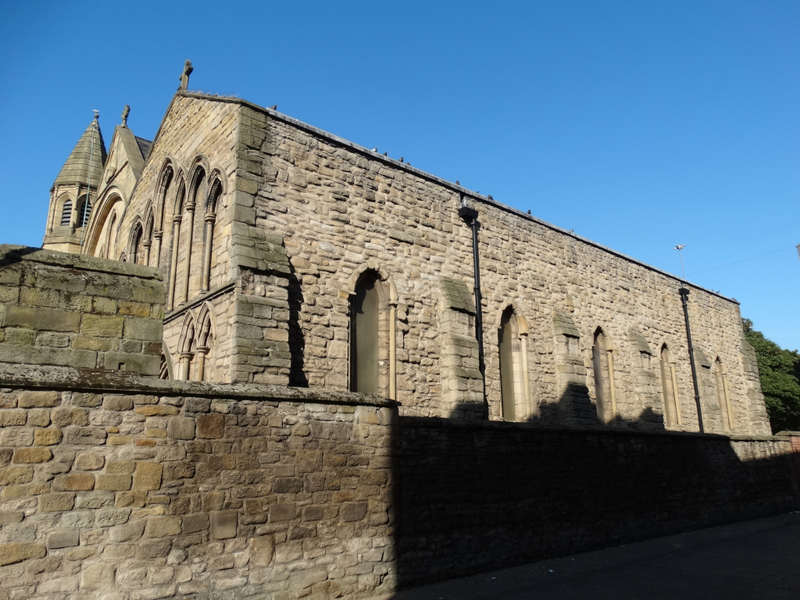 In 1448 the chapel passed into the hands of the nuns of St Bartholomew, Newcastle. They had run into financial difficulties and the Bishop of Durham appropriated to them the hospital and all its possessions on condition that the nuns provided two chaplains to celebrate in the chapel, kept the buildings in good repair, and paid a yearly pension to the Bishop and Prior of Durham. When the monasteries were dissolved by Henry VIII, the nunnery and its lands were surrendered to the crown in 1540. 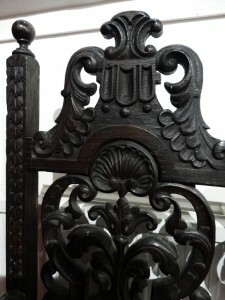 For two centuries the building was closely associated with two families, the Riddells and the Claverings. William Riddell was related to the last Prioress by marriage and he bought the hospital lands and built a mansion just to the east of the chapel in the late 16th century. 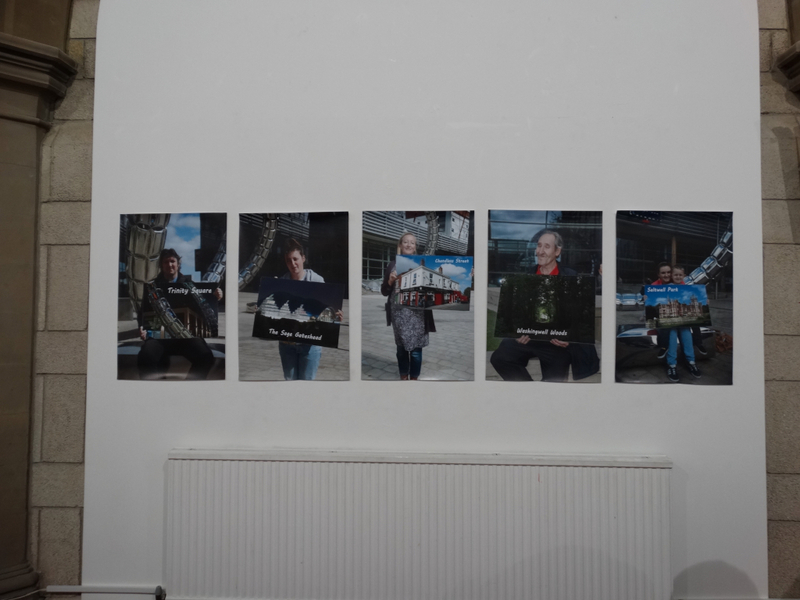 The next generation of Riddells converted to Roman Catholicism and the mansion became a centre for Jesuit mission. The Claverings were also staunch Roman Catholics, and a succession of chaplains served in the private chapel within the mansion. The Chapel was not used for worship as in those times of intolerance and persecution it would have been too dangerous. There is another Catholic link in the martyrdom of John Ingram in 1594. 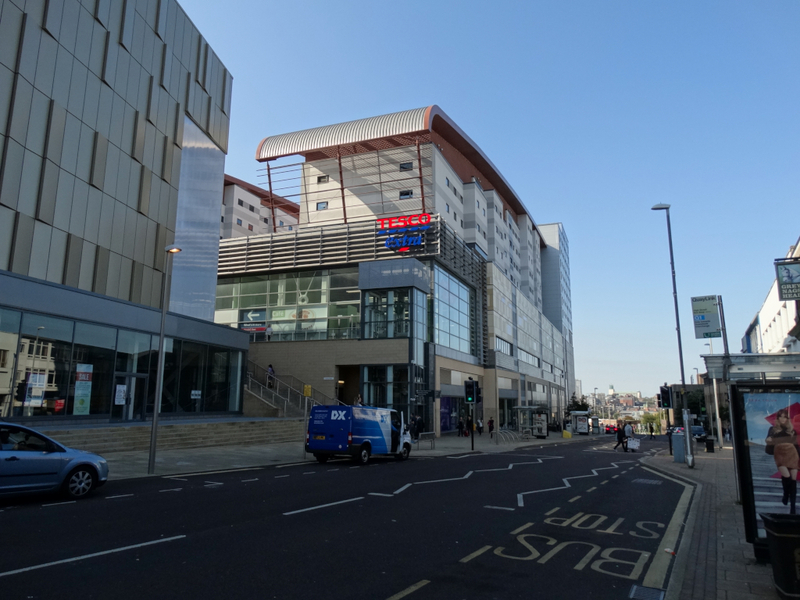 He was a Jesuit priest from Hereford who was held in the Tower of London for a while (where he was tortured), and was killed on 26 July in Newcastle or Gateshead. 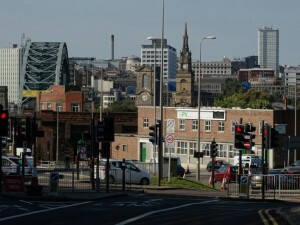 There is an annual walk and memorial service across the Tyne which ends here – more details at http://www.rcdhn.org.uk/about_the_diocese/saints/johningram.php. 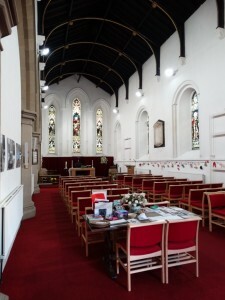 There is a legal judgement at http://www.ecclawsoc.org.uk/1995-case-reports/607-re-st-edmunds-chapel-gateshead.html when the incumbent and churchwardens of this church wanted to erect a memorial plaque, but he is not recognised as a “martyr” by the Church of England – “no court of the realm could properly sanction the commemoration of anyone so executed as a traitor unless and until a posthumous pardon had been granted by the Queen.” Fortunately I don’t need a faculty to describe him as a martyr on this blog. In 1746 the mansion was burnt to the ground by an angry mob – the story goes that the Duke of Cumberland was due to pass through Gateshead on his way to Scotland to defend the Hanoverian succession and the Protestant cause. An enthusiastic crowd gathered, and some climbed onto the garden wall of Gateshad House. The gardener set the dogs on them, and they burned the house down. The Chapel was already in ruins by this time and at the turn of the 19th century it was used as a builders yard. A man called Cuthbert Ellison acquired the land in 1836 and the Chapel was given to the Rector and Churchwardens of Gateshead. 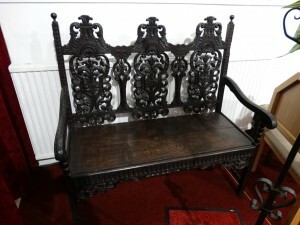 It was restored for divine service in October 1837 as Holy Trinity Chapel. 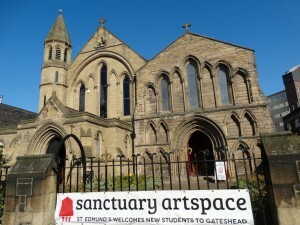 Gateshead’s population grew and the Chapel was threatened with demolition in the 1880’s because a bigger building was required. 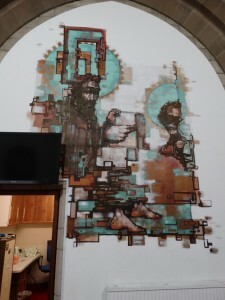 Instead of demolition, the north wall was removed and the chapel turned into the south aisle of a new church dedicated to the Holy Trinity in 1894-6. 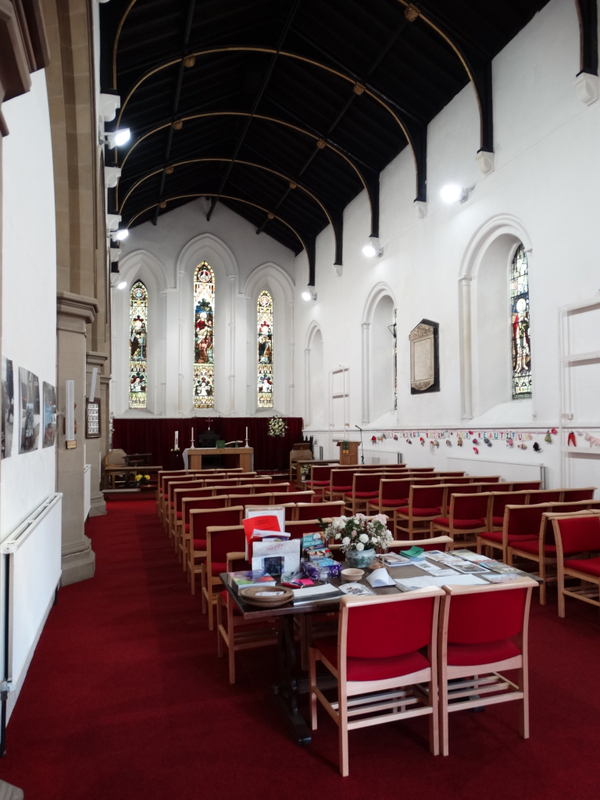 Holy Trinity was declared no redundant in 1969 but the Chapel was partitioned off and used for weekday services and private prayer. 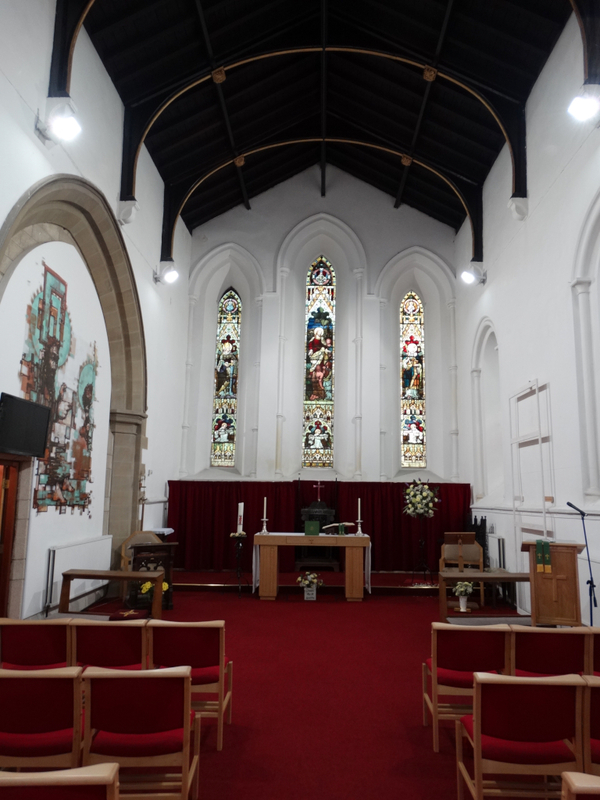 Sunday services restarted in the Chapel in 1981 after the parish church of St Mary’s was destroyed by fire. It reverted to its original name of St Edmund’s Chapel. 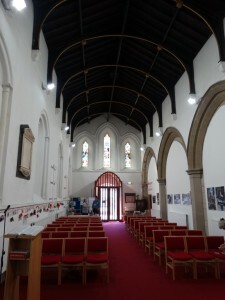 The Victorian addition to the church was leased to Gateshead Council and became Trinity Community Centre. The North Wall of the church is now a useful art space – I liked the photos of Gateshead, but I’m not sure about the painting of Christ (I assume), not sure who it is by, either. 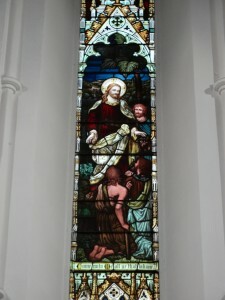 The stained glass is by the Atkinson brothers. Their parents were William Henry Atkinson and Anna Maria Sparrow who both lived in Ryton – William was a grocer and tea dealer. Three of the boys – William, Frederick and Albert – became stained glass window artists. 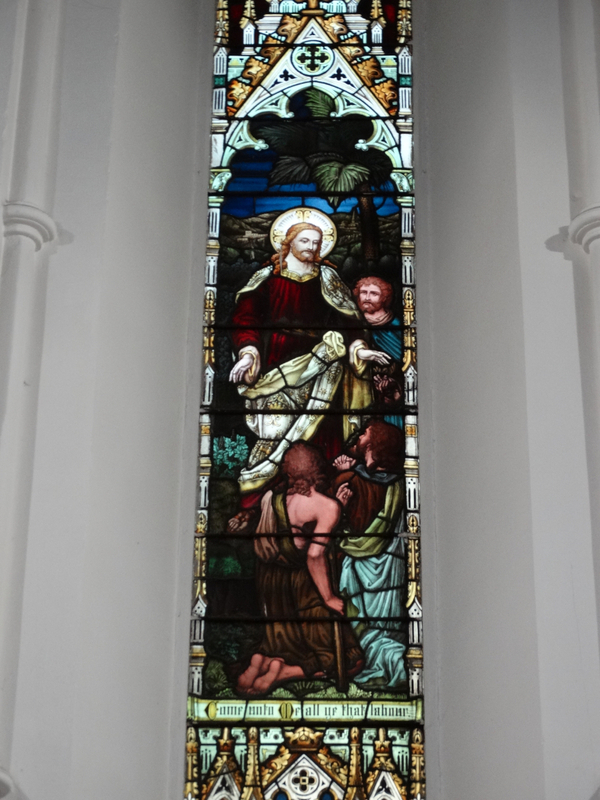 It makes you wonder how the sons of a tea dealer became stained glass windows artists. 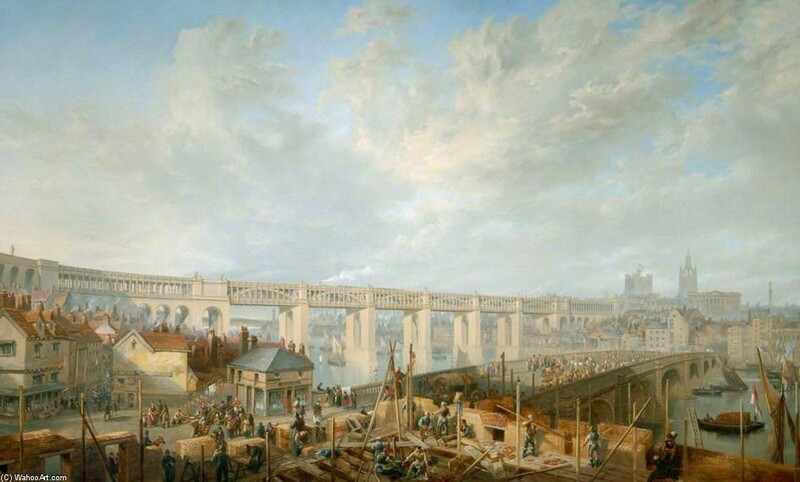 The business started in 1876, William died in 1890, and the others continued in business. 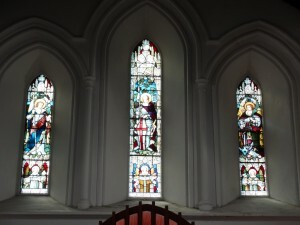 A large amount of their work was memorial windows after WW1. Frederick died in 1927 and Albert sold his business to Reed Millican in the early 1930s. 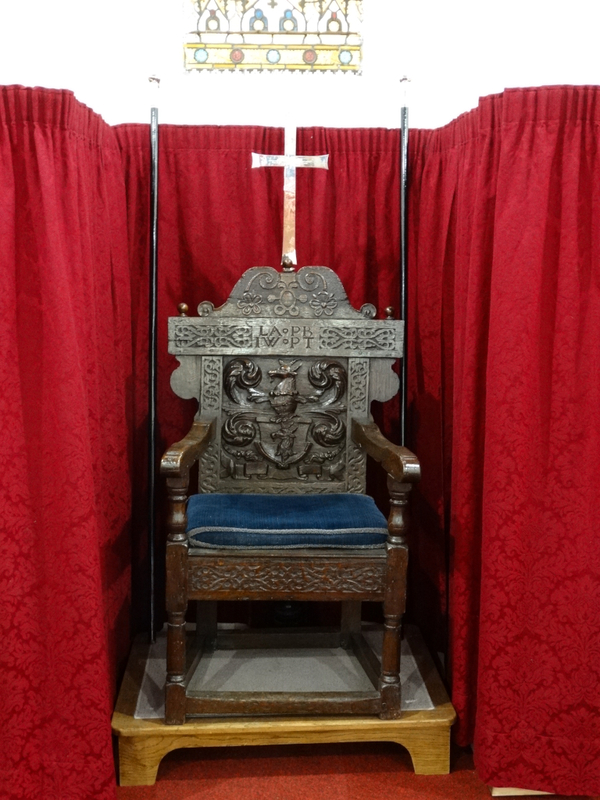 There is a lovely Bishop’s Chair which was inherited from St Mary’s church, which stood at the Gateshead end of the Tyne Bridge until it burned down in 1979. It is oak and bears the arms of the town. The initials on the chair back are those of Lancelot Ayer, Peter Bell, John Wolfe and Peter Trumble, who were churchwardens of St Mary’s in 1666. The Parish Books of that year include the item “Paid for a New Chaire and Covering a Stoole for ye Vestry … £1 2s 0d.” There is another wooden bench which is gorgeous. I fought my way back through the traffic over the Tyne Bridge to our side of the river. Let me illustrate the Tyne Crossing with the wonderful painting of the High Level Bridge by John Wilson Carmichael. This entry was posted in Durham, Newcastle upon Tyne. Bookmark the permalink. This is fascinating reading for a foreigner like me: I now relate “true”, real things that happened with the broader knowledge of history I may have. And I admire the level of research you have to make for each blog! I am also trying to follow you on a map! 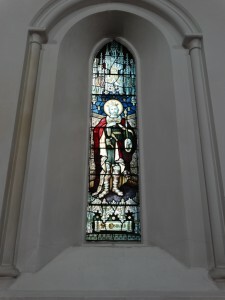 I was interested to hear of your connections to St. Edmund and your attempts to link various churches. 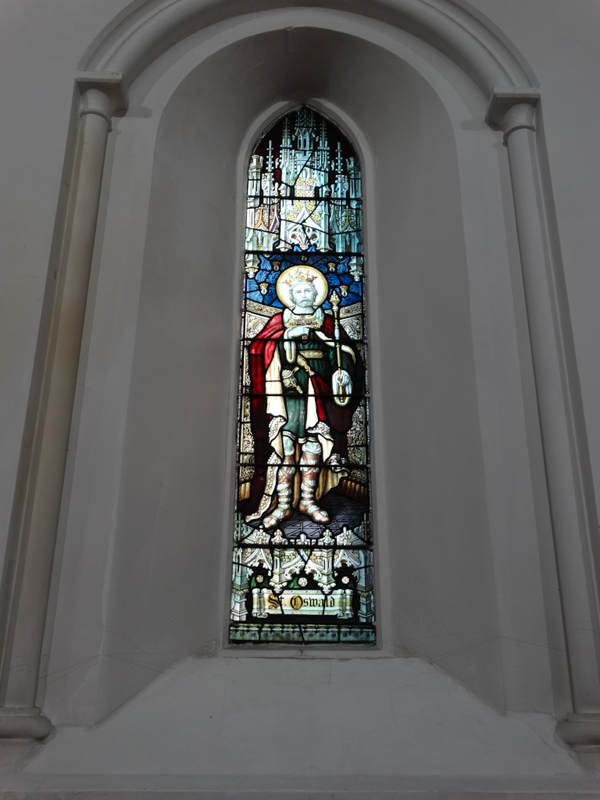 St. Edmund as you know was born in Abingdon – now called Abingdon on Thames. His mother worshipped at St. Nicholas’s Church in the Town Square. St. Edmund then went to Oxford and St. Edmund Hall College now stands on the site where he taught. I taught at St. Edmund’s School in Abingdon and now retired, I am a Trustee for the Civic Society and in charge of Events for the Abbey buildings. However, I have also joined links with St. Edmund Hall and the St. Edmund Society which looks after the Dover Chapel. We are hoping our project will grow and are setting up a celebration on his birthday November 20th at St. Nicholas’s Church. Meanwhile, we are searching for all links to St. Edmund and they begin in the UK, move to France where he is buried and other links in America. So the tentacles spread far and wide. Lots of work to be done. I am the Atkinson Brothers makers of the stained glass 3 x great niece and just wanted to put the record straight . Their parents came from Ripon not Ryton .